As they pull on hats, scarves, and mittens for their daily commutes, employees of Farbman Group in the Southfield City Centre are thinking about more than just keeping warm. They’re thinking about those who struggle every day in our community. That’s why Farbman Group employees are sponsoring a collection drive for new and slightly used hats, mittens, gloves, and scarves. Between December 10 and December 17, 2018, they will be gathering these items to donate to the Baldwin Center in Pontiac. The effort is a “pay it forward” initiative that Tammy Felhandler, accounts payable specialist at Farbman Group, says is important for community support. “I believe that if you have the ability to help, that kindness goes a long way,” Felhandler says. This is not the first charitable effort that Farbman Group, a commercial real estate firm based on Northwestern Hwy., has spearheaded. In fact, social responsibility is woven into its way of doing business. With “Farbman Cares,” a committee dedicated to seeking out ways of supporting the community, the company does a local fundraising effort each month. Organizations such as Almost Home Animal Shelter in Southfield, Gleaners Community Food Bank, and Game on Cancer at Henry Ford Hospital and others have benefitted from Farbman employees’ generosity. “We always try to brainstorm how we can help others, or collaborate with organizations that are doing this work,” says Felhandler. No effort is too small. March Madness collections have benefitted the Southfield High School forensics team in the past, she says. 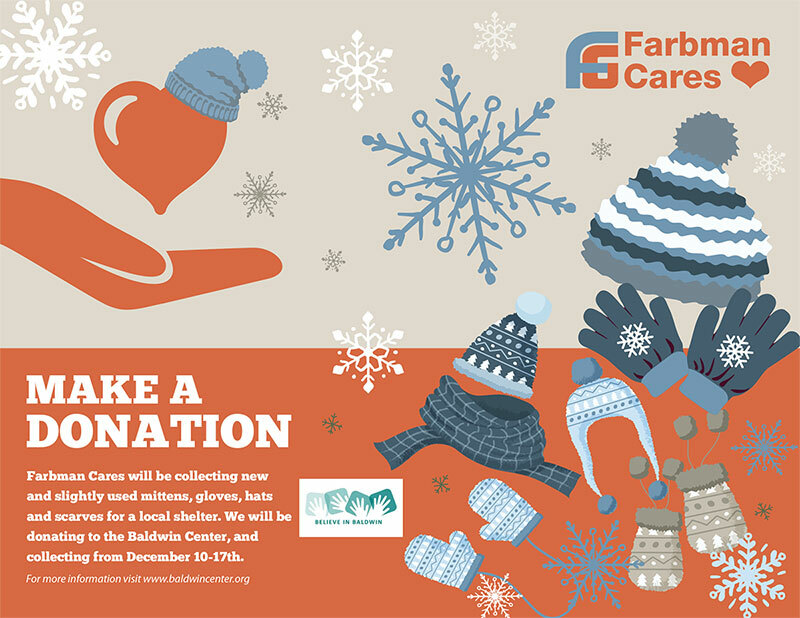 Individuals can donate to the Baldwin Center warm accessories drive by simply bringing items to Farbman Group’s office by December 17. Find Farbman Group at 28400 Northwestern Highway, 4th floor, Southfield. (248) 353-0500. For larger donations, please email farbmancarescommittee@farbman.com.